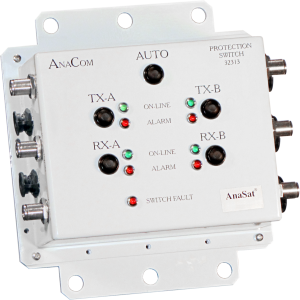 Protection Switch Redundancy Systems | Anacom, Inc.
AnaCom’s Protection Switch System provides a high reliability 1 for 1 Hot-Standby configuration for AnaSat® C and Ku-Band transceivers, ELSAT® BUCS, and a combination of ELSAT BUCs and LNBs. The Protection Switch System is ruggedly built for continuous outdoor duty in all types of environments. The Protection Controller is designed for simple, intuitive operation. TX and RX switches function independently. The Protection System consists of a Protection Controller outdoor box, and WR-229 and WR-137 waveguide switches for C-Band applications, or a pair of WR-75 waveguide switches for Ku-Band applications. Both switches include waveguide terminations for the off-line equipment. Only a single RS232/485 interface cable is required to interface to an indoor computer/dumb terminal. AnaCom’s Protection System integrates all necessary functions into a small, highly integrated outdoor package which is designed to give highly reliable service in a wide range of environments. The Protection Controller is fully contained in a single, small outdoor box with manual over-ride controls. Although normally intended for unmanned, automatic operation, the switch can be locally (or remotely) over-ridden to place a particular TX or RX switch (or both) on line and defeat the normal “switch-on-alarm” mode of operation. A single push-button (or remote command) returns the unit to completely automatic operation.